SOCIB High Frequency (HF) Radar Facility consists of two CODAR SeaSonde radial stations with antennas overlooking the Ibiza Channel; one antenna is located at the western coast of Ibiza Island (38º 57.1' N; 001º 13.1' E), and a second one is located at the western coast of Formentera Island (38º 39.9' N; 001º 23.3' E). Each antenna emits HF signal, which impacts the rough surface of the sea. 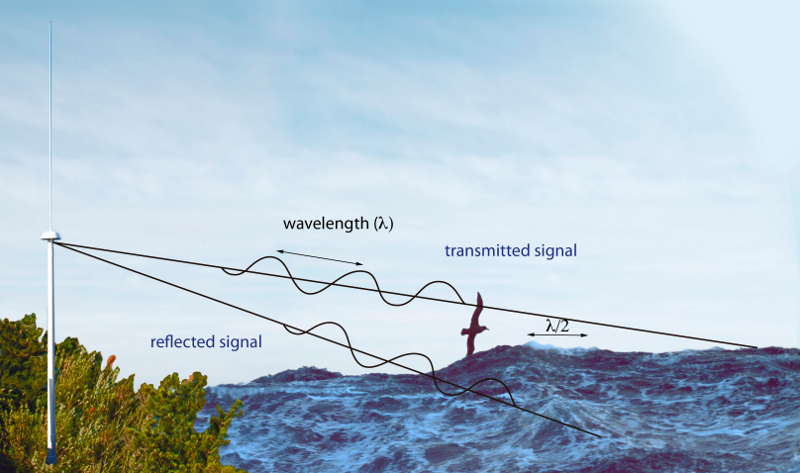 The antenna captures the signal reflected when the scatter wave is half of the transmitted signal wavelength. This phenomenon known as the Bragg principle allows knowing the wavelength, the period and the travel direction of the water surface. Additionally, the radial velocity is subtracted from the reflected signal Doppler-frequency shift, towards or away from the radar. Schematic representation of the Bragg phenomenon. The radial velocities are processed from the 15-minute averaged spectra received every 10 minutes at the antennas. The hourly radial velocities are obtained applying a centered 75-minute running average. These hourly radial velocity data obtained from each antenna are converted to total fields at the central combine station. The central combine station is located at SOCIB and receives data from both radial stations and converts them into a gridded 2D total velocity field. 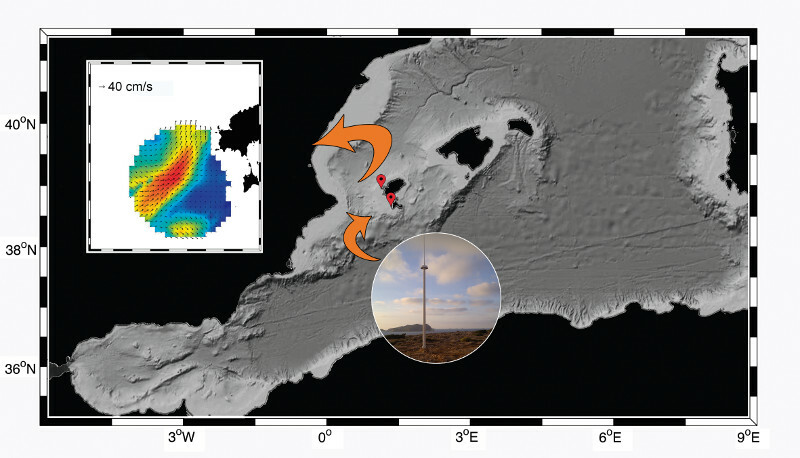 The antennas emit at a central frequency of 13.5 MHz and a bandwidth of 90 kHz, which cover an approximately 70-km range offshore, with 3-km radial and 5º angular spatial resolution. The hourly total velocity field has a 3 by 3 km resolution on a rectangular grid. The radial velocities from each antenna are combined to obtain a 2D grid total velocity map.